These crowd-pleasing lentil patties are so easy to whip up. Served with creamy, herbal cashew cream, they also look elegant enough to serve at any dinner. These patties are also excellent as leftovers, or even as veggie burgers on whole grain buns with the basil arugula cashew cream as a spread. Place lentils in a small pot and add broth. Cover and simmer over medium heat about 45 minutes, stirring occasionally, until very tender. Drain any leftover liquid and transfer cooked lentils to a bowl and stir in chia seeds. Add carrots, potato, onions, arugula, basil, garlic, mustard, oats, bread crumbs, soy sauce and salt and pepper (optional) to taste. Stir well to make a thick mixture. Place 1 tablespoon olive oil in a large skillet (cast iron works well). Heat well. Form patties by pressing a handful of the lentil mixture into a firm, think patty. Drop in skillet (4-5 per batch) and cook for 7 minutes on medium heat. Turn carefully and cook on the other side for 7 minutes. Repeat process, adding another tablespoon oil to pan, until all patties are cooked. To make Basil Arugula Cashew Cream: Prepare 1 cup cashew cream according to basic instructions in the blender. Add fresh arugula and basil and process until smooth, creamy, and light green in color. 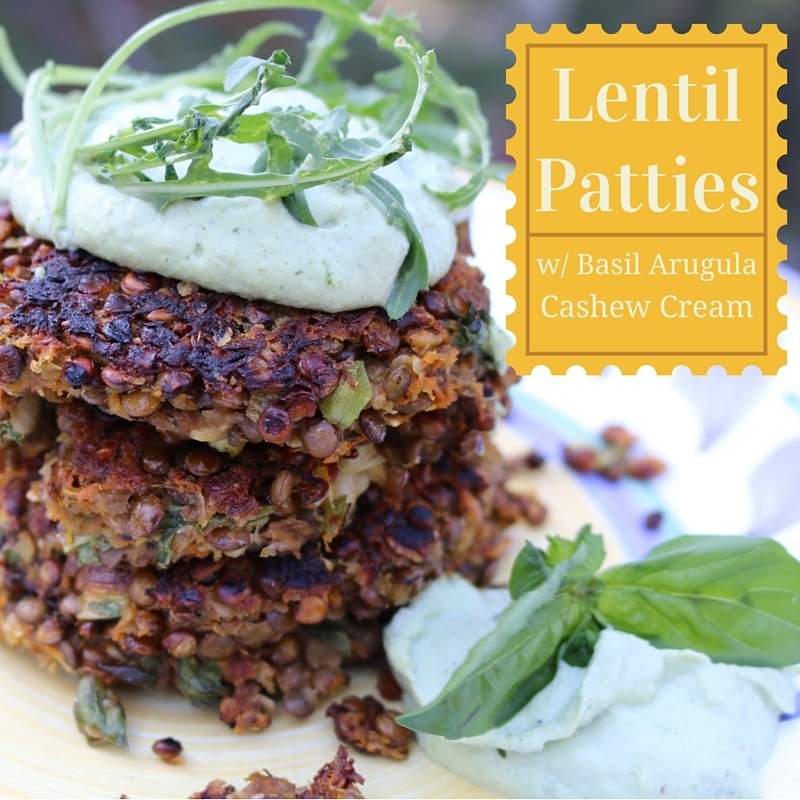 Serve Lentil Patties with a dollop of Basil Arugula Cashew cream. Refrigerate any leftovers in an airtight container for up to 3 days. Sharon Palmer, RDN, The Plant-Powered Dietitian™, is an award-winning food and nutrition expert, journalist, and editor. She is author of The Plant-Powered Diet: The Lifelong Eating Plan for Achieving Health, Beginning Today (The Experiment, 2012) and Plant-Powered for Life: Eat Your Way to Lasting Health with 52 Simple Steps & 125 Delicious Recipes (The Experiment, 2014). Sharon also is editor of Environmental Nutrition, nutrition editor of Today’s Dietitian, blogger for The Plant-Powered Blog, and publisher of her monthly The Plant-Powered Newsletter. Living in the chaparral hills overlooking Los Angeles with her husband and two sons, Sharon enjoys visiting her local farmers market, gardening, and cooking for friends and family.